Fifty years ago MacArthur and Wilson predicted species diversity on islands would approach a dynamic equilibrium balancing colonization, and some speciation, against extinction. The long-term species diversity of Greater Antillean New World leaf-nosed bats and close relatives shows such an equilibrium, as well as how Holocene extinctions have dragged diversity far from it. Cover photo by Carlos Mancina. From the beginning, MacArthur and Wilson’s (1963) equilibrium theory of island biogeography introduced colonization and extinction as the key processes explaining the diversity of species on islands, with the evolution of new species contributing some proportion of lineages. But most island biogeography studies since then focused on comparing the number of species on islands of different area to expectations from the theory. Only new dated phylogenies or evolutionary trees would enable quantifying the three key processes theoretically responsible for species diversity across islands. In short, estimating colonization, extinction and speciation rates has only recently become possible. The mathematical implementation of a 50-year-old model was not the only obstacle to testing MacArthur and Wilson’s theory. Since the arrival of humans, many island species have been lost to overhunting, the transformation of native habitats for agriculture, and invasive predators. In the Caribbean alone, more than half of the mammal species were wiped out following human colonization, including several primates, dozens of hutias or endemic rodents, and many different ground sloths. The extermination of so many species by itself poses a problem. With few or no survivors, it is difficult to place the missing species in phylogenies to test the equilibrium theory. Human-caused extinctions have reshaped island communities in ways we can seldom quantify. But there are exceptions: the fossil record from the Caribbean islands is the reason we know all those species went extinct. Along with sloths, hutias, and primates, this record includes many bats. In the Antilles, most bats survived the massive wave of Holocene extinctions of the last 12,000 years. Thanks to decades of work by Ross MacPhee, Donald McFarlane and David Steadman, as well as young paleontologists working in the Caribbean, including Siobhán Cooke (Picture 1), Angelo Soto, Emmanuelle Stoetzel and Sam Turvey, the timing of Caribbean extinctions, particularly for bats, is better known today than ever before. Their excavations and new dates have revealed waves of bat extinctions on different islands, the latest and largest one following human arrival. Picture 1. 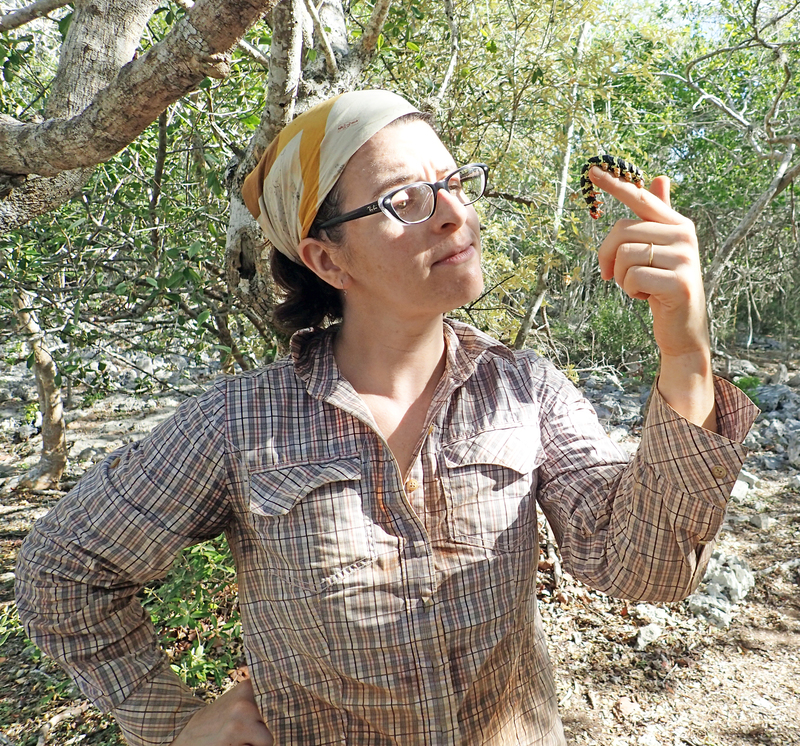 Paleontologist Siobhán Cooke in Pedernales, Dominican Republic in 2015. New fossil discoveries and radiocarbon dates from the Caribbean islands have shifted the balance of evidence for causes of Holocene mammalian extinction to human activities. Copyright Siobhán Cooke. Dating the latest record for fossils (or the last occurrence date) is not enough. Placing species in an evolutionary tree requires data and, for most living species, this means sequencing DNA from tissue samples. Since 2001, and with support from the US National Science Foundation (NSF), I’ve been leading expeditions to the Caribbean to obtain samples from bats, making it possible to build phylogenies (Picture 2). Starting in 2009, we focused our collections and analyses on the New World leaf-nosed bats and their close relatives, an ecologically diverse tropical group that includes the fishing bat, many fig-eating bats, and the famous vampire bats. In a similar collaboration with Brazilian scientist Valéria Tavares, we have focused on integrating genetic and fossil data to find out where in the phylogeny some of the extinct Caribbean bats belong. The phylogenies from these different projects covered all known Greater Antilles species in the bat group, including those that went extinct during the Holocene. Picture 2. Liliana Dávalos, Jacqueline Salazar (left of center) and Dominican students at a workshop at Parque Biodiversidad outside Santo Domingo in 2014. Bat samples for genetic analyses have been indispensable to infer dated phylogenies, and estimate dates of colonization and speciation in Greater Antillean leaf-nosed bats and close relatives. Copyright Laurel Yohe. The final key to modeling the diversity of bats through time was implementing the model, a task that had been in various stages of progress since MacArthur and Wilson first published their theory. In 2014 Luis Valente (Picture 3) and Rampal Etienne, together with Ally Phillimore, developed a modeling approach capable of integrating speciation with extinction and colonization based on dated phylogenies. They called their method DAISIE for Dynamic Assembly of Islands through Speciation, Immigration and Extinction, and tested it with the land birds of the Galápagos islands. The Galápagos study showed it was possible to estimate rates of speciation, extinction and colonization for island communities, but the results revealed non-equilibrium dynamics in the archipelago and, lacking any fossils, provided no insight into possible human-caused extinctions. Picture 3. 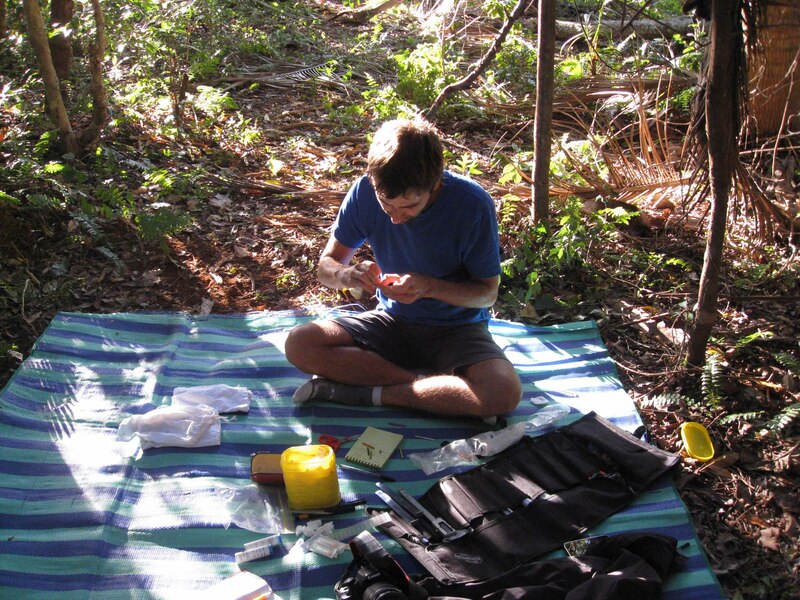 Luis Valente collecting bird samples on Lifou island (Loyalty Islands, South Pacific) in 2013. Without models to estimate rates of colonization, extinction and speciation across an entire archipelago community, previous tests of the equilibrium theory of island biogeography integrated only dispersal and extinction rates. Copyright Olivier Hebert. Early in 2015, Luis Valente was presenting the Galápagos results at the International Biogeography Society meetings when I was presenting new dated phylogenies of New World leaf-nosed bats and relatives. After a brief conversation at the meeting, we started long-distance communication to analyze the bats of the Greater Antilles, focused first on uncovering the long-term dynamics of the system. Fifty years ago, MacArthur and Wilson predicted equilibrium dynamics should be dominant on islands, but the theory has been questioned for failing to include important changes in island area or the effects of elevation on island diversity. Indeed, the study on the Galápagos found no evidence of equilibrium. From the start, Caribbean bat dynamics proved different from the Galápagos bird analyses. The number of bat species on the Greater Antilles tends to an equilibrium value over many millions of years. But the path to equilibrium differs from what MacArthur and Wilson originally envisioned, as speciation plays a decisive role in balancing a very high extinction rate. Finding equilibrium dynamics in the Caribbean bat community suggests MacArthur and Wilson were right all along. Long-term equilibrium also made it possible to evaluate the effects of Holocene extinctions on dynamics across the archipelago. Unlike the Galápagos, which has experienced very few anthropogenic extinctions, the Holocene wave of extinction among Caribbean bats dramatically transformed that fauna. We decided to extend DAISIE to incorporate extinct species and simulate the time required to regain recently lost diversity. This led to long discussions on how to correctly incorporate data from fossil species, considering the timing of extinction is not known in every case. The results were astounding. If, as supported by current fossil dates, humans caused many of these extinctions, natural processes of colonization and speciation would need at least 8 million years to restore the diversity of now-extinct bat species to the Great Antilles. If only fewer than a handful species went extinct because of human activities (a conservative estimate), >2 million years are still needed to regain those few species. In any case, millions of years are needed for nature to bring back the diversity lost over the last few thousand years. The staggering disparity in the time scales of natural processes and human activities is a powerful reminder of our own impact on natural communities. As we search for alternatives to reduce human effects on biodiversity today, our study offers a window into the long-term dynamics of the Greater Antilles and its contrast with the rapid changes since human arrival. Cooke, S. B. and M. Tallman. 2012. New endemic platyrrhine femur from Haiti: Description and locomotor analysis. Journal of Human Evolution 63:560-567. Dávalos, L. M. 2004. Phylogeny and biogeography of Caribbean mammals. Biological Journal of he Linnean Society 81:373-394. MacArthur, R. H. and E. O. Wilson. 1963. An equilibrium theory of insular zoogeography. Evolution 17:373-387. MacPhee, R. D. E., M. A. Iturralde-Vinent, and O. J. Vazquez. 2007. Prehistoric sloth extinctions in Cuba: Implications of a new "'Last" appearance date. Caribbean Journal of Science 43:94-98. McFarlane, D. A., J. Lundberg, and A. G. Fincham. 2002. A late Quaternary paleoecological record from caves of southern Jamaica, West Indies. Journal of Cave and Karst Studies 64:117-125. Rojas, D., O. M. Warsi, and L. M. Dávalos. 2016. Bats (Chiroptera: Noctilionoidea) challenge a recent origin of extant neotropical diversity. Systematic Biology 65:432–448. Soto-Centeno, J. A. and D. W. Steadman. 2015. Fossils reject climate change as the cause of extinction of Caribbean bats. Scientific Reports 5:1-7. Stoetzel, E., A. Royer, D. Cochard, and A. Lenoble. 2016. Late Quaternary changes in bat palaeobiodiversity and palaeobiogeography under climatic and anthropogenic pressure: new insights from Marie-Galante, Lesser Antilles. Quaternary Science Review 143:150-174. Turvey, S., J. Oliver, Y. Narganes Storde, and P. Rye. 2007. Late Holocene extinction of Puerto Rican native land mammals. Biology Letters 3:193-196. Valente, L. M., A. B. Phillimore, and R. S. Etienne. 2015. Equilibrium and non-equilibrium dynamics simultaneously operate in the Galápagos islands. Ecology Letters 18:844-852. Valente, L. M., R. S. Etienne, and L. M. Dávalos. 2017. Recent extinctions disturb path to equilibrium diversity in Caribbean bats. Nature Ecology & Evolution 1:0026. Velazco, P. M., H. O'Neill, G. F. Gunnell, S. B. Cooke, R. Rimoli, A. L. Rosenberger, and N. B. Simmons. 2013. Quaternary Bat Diversity in the Dominican Republic. American Museum Novitates:1-20.